Disease or damaged trees or trees that are simply growing out of their designated areas often must be cut down to maintain the aesthetics of the landscape. 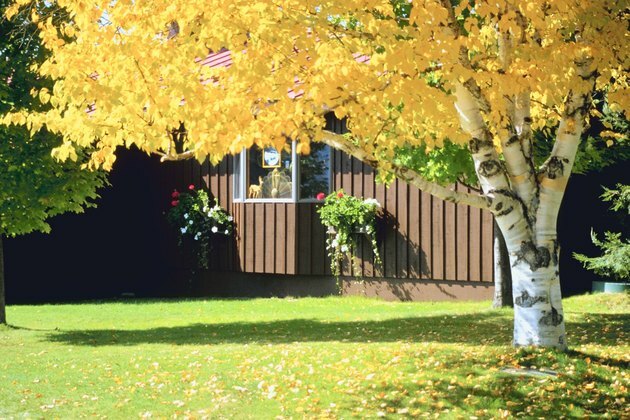 Trees that are growing too close to the home can cause plumbing damage or scrape the outside walls. Removing these trees requires making proper cuts, so they don't fall on the house. Prevent a disaster by taking the appropriate steps and making the right cuts, so that your tree falls in a safe area. Determine the height of the tree. Remove any obstacles, such as cars, bird baths or container plants, from the area. Check the lean of the tree to help you determine which way it is going to fall. Cut the top lateral branches to reduce the possible damage it may cause if it falls the wrong way. Use a ladder and have a friend support the bottom as you cut the top branches with a pruning saw. Trim off any densely growing branches around the bottom of the tree to give you better access to the trunk. Wrap a pull line around the top of the tree to pull it in the right direction. Tie a piece of rope at the top of the tree. With a chainsaw, make a V-shaped notch on the side where you want the tree to fall. First, make sure your cut is parallel to the ground. Make one slanted cut above this cut and one slanted cut below, creating a notch with a 90 degree opening. Make your back cut from the back of the notch cut. Cut slightly above the point of the notch cut. Have a friend pull on the line while you are doing this to give the tree direction to fall away from your house.